Kwaku Duah is a stove manufacturer in the Roman Hill district of Kumasi, the second largest city in Ghana. Two years ago Mr. Duah was trained to manufacture the “Gyapa,” a fuel-efficient charcoal stove introduced in Ghana by EnterpriseWorks/VITA (EWV) with support from the Shell Foundation and USAID. EWV trained local metalworkers to manufacture the Gyapa and then linked them with local retail outlets. Local ceramicists were also trained by EWV to produce the stove’s ceramic lining; these ceramicists sell directly to the manufacturers. Initially, stove manufacturers like Mr. Duah were given orders with 50% payment upfront so that they could build-up investment capital. Retailers were also given assistance by way of free transport and stocking on a sale-or-return basis. At the same time, the project conducted an intensive marketing campaign - tv and radio ads, open-market demonstrations - to establish Gyapa as a household name in Ghana. As consumer demand for the stove increased, the project began to scale back its support to the supply chain to ensure the sustainability of the activity. In May 2004, project assistance to the supply chain was removed and today these enterprises are operating and working together without project support. Since adding the Gyapa to his production line in June 2003, Mr. Duah’s business has really taken off: He has sold over 3,000 stoves and realized US $3,000 in profits from these sales. And with this money, Mr. Duah has been able to expand his business – he’s hired five employees -- and build a four-bedroom home for his family. Today Mr. Duah is 1 of 42 manufacturers supplying Gyapa stoves to 86 retail outlets in Accra and Kumasi. Together these retail outlets have sold nearly 54,000 stoves to consumers since the launch of Gyapa in November 2002, generating a total of US $311,000 for the enterprises producing and selling the stoves. Kwaku Duah is a stove manufacturer in the Roman Hill district of Kumasi, the second largest city in Ghana. Two years ago Mr. Duah was trained to manufacture the “Gyapa,” a fuel-efficient charcoal stove introduced in Ghana by EnterpriseWorks/VITA (EWV) with support from the Shell Foundation and USAID. EWV trained local metalworkers to manufacture the Gyapa and then linked them with local retail outlets. 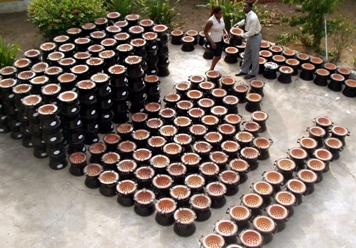 Local ceramicists were also trained by EWV to produce the stove’s ceramic lining; these ceramicists sell directly to the manufacturers.